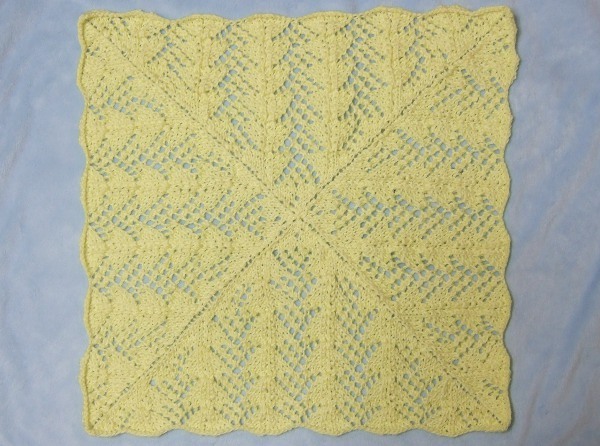 This blanket is designed to coordinate with the fan lace hat of my Two Lace Baby Hats pattern. The blanket is knitted in the round, working from the outside in. sk2p = slip 1, knit 2 together, pass slip stitch over the knit 2 together; 2 stitches have been decreased. After each set is cast on, place one of the three like colored stitch markers. Extra Small – Cast on 4 sets of 87. Small – Cast on 4 sets of 111. Medium – Cast on 4 sets of 135. Large – Cast on 4 sets of 159. Extra Large – Cast on 4 sets of 183. Join to knit in the round being very careful not to twist. Place the different colored stitch marker to mark the changing of rounds. There is also a chart available. The directions for each round are to be worked between corner markers for each of the four sides. Repeat rounds 1 through 16 until there are 15 stitches between each marker. excellent piece of work ! when the child grows up these blankets can be turned into cushion cover with little mending , it enhances sofas’ grace. what a lovely baby blanket, i can’t wait to try this one, i have a couple projects started now i have to finish first….thank you for the pattern. This is very pretty and I will definitely be giving it a go although I have never knitted in the round before. I just have to finish a baby coat that I have just started. This looks beautiful. I am going to attempt to make it. What color did you choose to make this blanket? We are making pink and blue (separate) for new babies at our church. But, I was thinking of later use for the blanket and pink/blue probably wouldn’t work for that. I made the example in a soft yellow. I think it would also be lovely in white, cream or a soft light green. Beautiful. Has that vintage touch. Just what I’ve been looking for. 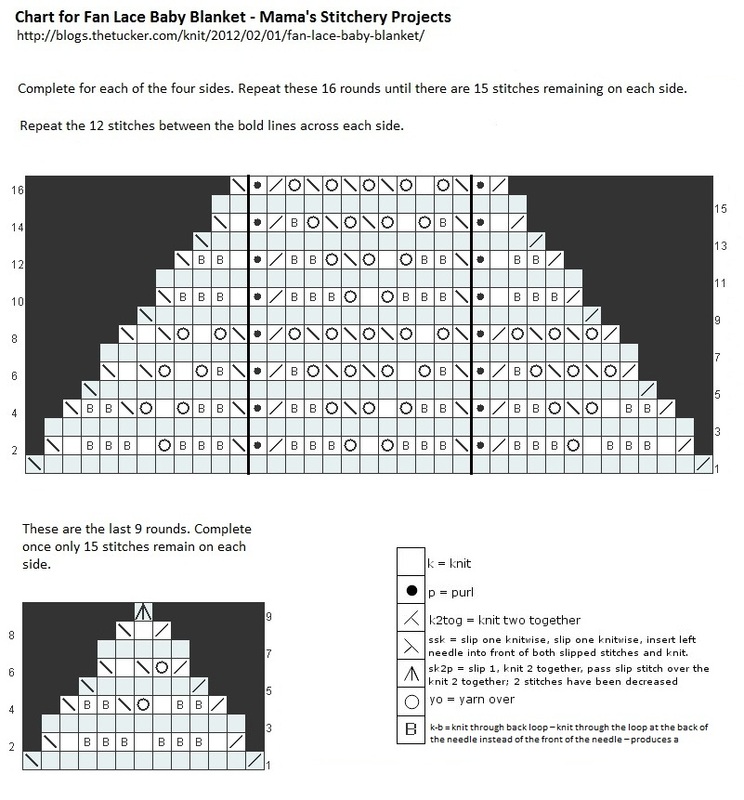 This pattern looks really pretty, but I have a little confusion,it says 4 sets of 183 sts.The total comes to 732 sts. In the magic loops it needs equal number of stitches. Could you please confirm this. I would like to knit this baby blanket. You wouldn’t need to begin with the magic loop since this will be sufficiently large to fill almost any size circular needle and just joining and knitting in the round. You are correct about the 732 stitches. When I made the blanket I started on a large circular needle. After a few inches I moved to a smaller circular. Once it was going to be too small for my smaller circular, I went back to my larger circular for a magic loop. I put two sides of the blanket on one side of the magic loop and the other two sides of the blanket on the other side. At that point I removed the markers for the corners that were at the breaks since I would always know that was a corner. Hope that helps. It should make more sense when you get into making it and see how it takes shape. My mother started a blanket with similar pattern but was not able to finish it. Now 70 years later I can finish it! Thank you for the pattern for the beautiful blanket and for the memories rekindled. This is a beautiful pattern and I am having great difficulty with it. The decreasing has me stymied. I note that on the end of row 2 the corners are each beg. with 11sts and ending with 10sts. and progresses, 10&9, 9&8, 8&7, then Row 10 appears to be 6&5, and Row 12 5&4. Is this correct? When the 16th row is finished and starting again I am absolutely baffled by the decreasing sequence. Can you help please? The fan is a 12 stitch repeat. To keep the blanket flat, I have decreases at each side of the corners for 3 rows then skip a row. After 16 rows, the decreases have moved in 12 stitches to the next fan repeat, which is why the pattern can repeat after 16 rows. Please let me know if that doesn’t make sense and doesn’t help. I’m a math person, so I know all my calculations may not be so apparant to the non-nerds of the world. i KNIT BLANKETS AND SWEATERS FOR CHARITY AND USED TO DO lINUS BUNDLES. wHEN i GET DONATIONS OF YARN OR FIND A GOOD YARD SALE i GET STARTED AND GO WILD. iN THE WINTER cHRISTMAS AT sEA HELPS WITH YARN AND i SEND COMPLETED PROJECTS FOR THE SAILORS IN nj. i DESIGN BURIAL OUTFIS AND CRHISTENING OUTFITS OFR NEWBORNS AND PREEMIES. I am a little confused. What is a magic loop? Does k3-b mean knit three stitches AT ONCE through the back loop? Or does it just mean knit the next three stitches one at a time through the back loop? Thanks in advance! Knit the next three stitches one at a time through the back loop. Would it be possible to make this blanket with striped fan rows? If so, how many rows does the medium sized blanket work out to be? Thanks–it’s a beautiful pattern. I think it would look great. The medium has 89 rounds to the center. This pattern is going fairly well, and looks pretty, but I am having trouble with the yarn over. On the next row it is tight and difficult, and it does not look as open as I thought it would. Should I be doing another manoeuvre, such as a wool round needle, and should it be from back over the top and then back to the back twice to achieve the open effect? I just did a standard yarn over when I made this. If you knit tighter, that could effect it, and different yarns could behave differently. Thank you for your comment. I experimented with knitting into the back of the stitch in the following row, and achieved the open effect I was looking for. In a cashmire, silk and mink mix, and an alpaca fine yarn for the last three patterns, I ended up with a little beauty I am proud of! Delicate, soft and warm for my little grandson expected to join us in May_June! Great pattern! Beautiful pattern. I am trying to determine how much DK weight yarn I will need for a medium size blanket. I do not want to run out! Thank you. I didn’t realize I hadn’t added a yarn requirement chart for this pattern. I added one now. The medium takes 10.44 oz/538.42 yrds. After the first 16 rows, the pattern repeats from row 1. At the end of that second row 1, there are 157 sts in each section but the last, which has158. This doesn’t fit for the second row 2. There are 3 extra stitches. I’ve been careful that each row has come out evenly. What might I have missed? You can add sets of 24 stitches to each side’s cast on for increases of 4″ each. Is double knit baby the same as just regular double knit? Yes. With the new weight labeling system it is a #3 Light. I would like to make this baby blanket using a super fine yarn and 2.75mm circular needle. How many CO per side and how much yarn would I need for a large blanket (about 30×30). Cast on 231 per side. It’s harder to estimate yarn needs when making yarn weight changes, but my guess-timate would be between 1,300 and 1,800 yards. There are decrease and increase stitches in the repeated sections that cancel each other out, but on most rounds there are decreases at the beginning and end of each of the four sections so on those rounds the total stitches should be decreased by 8. I found out last month that I’m going to be a grandmother for the first time. After surfing the net for patterns and searching through my stash,I was lucky to come across this pattern which I already had enough yarn for, enough to make the large blanket. I just finished it this morning and it’s beautiful! It was quite an easy repeat pattern, the only difficulty being the large number of stitches to start with. I would like to say THANK YOU Mama for making this pattern available for others to use. I know that a lot of time and energy goes into it.